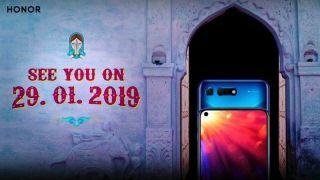 After a number of teasers and much anticipation, the date for the India launch of the Honor View20 is finally out. The brand's flagship smartphone will be launched on January 29, a week after its global launch in Paris on January 22. The smartphone has been listed on Amazon India, and the e-commerce company is taking registrations of interest- they have activated the 'Notify Me' button, so you'll be accordingly notified when the device finally becomes available to purchase. Pricing details remain unclear for now. The Honor View20 has already been launched in China as the Honor V20, and the price starts at CNY 2,999 (about Rs. 30,400) in China for the 6GB RAM + 128GB storage option. The price goes up to CNY 3,499 (approximately Rs. 35,500) for the 8GB RAM + 128GB storage option, and CNY 3,999 (approximately Rs. 40,600) for the Moschino Edition. The specs for the Honor View20 should be identical to the V20. The biggest newsmakers on the Honor View20 are the punch-hole on the display that houses a 25MP selfie camera, and the world's first 48MP rear camera. The phone features a 6.4-inch full-HD+ (1080x2310 pixels) display with 19.5:9 aspect ratio. Under the hood will be a 7nm octa-core HiSilicon Kirin 980 SoC, paired with up to 8GB of RAM. Inbuilt storage is 128GB or 256GB, depending on the model. However, there is no memory expansion slot in the phone. The View20 packs a 4,000mAh battery along with connectivity options like Bluetooth v5.0 and Wi-Fi 802.11 a/b/g/n/ac. There is also a USB Type-C port on the phone. The View 20 runs Magic UI 2.0 based on Android 9 Pie. The Magic UI is very similar to its predecessor the EMUI, apart from a new colour scheme, real-time in-call voice translations, and more. Rumour has it that Honor will also be launching the Honor 10 Lite, a successor to the Honor 9 Lite, in India on the same day. Both phones will be available on Amazon.in.